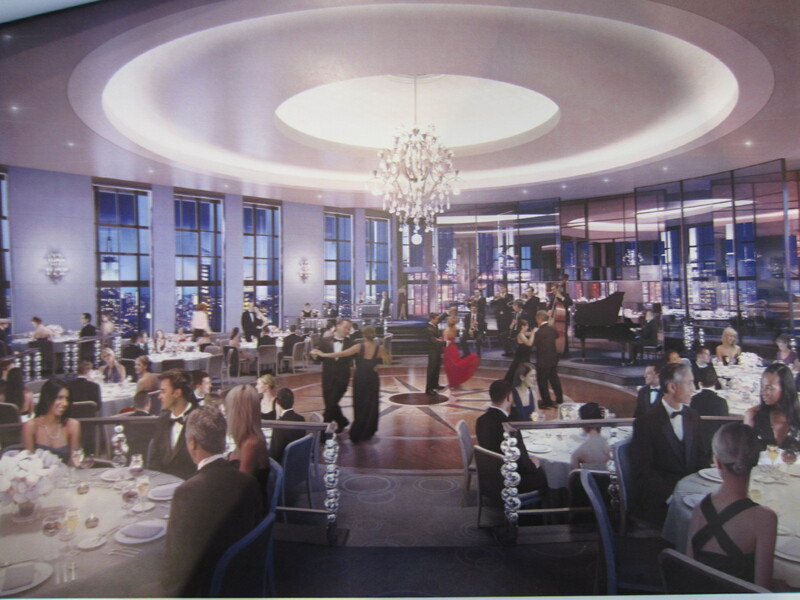 Rendering of Rainbow Room renovation. Image Courtesy: Gabellini Sheppard. Approved plans would retain and restore remaining original elements of interior landmark, while replacing the dance floor and altering the wall, floor, and ceiling surfaces. The Landmarks Preservation Commission voted to approve a renovation plan for the Rainbow Room on January 8, 2013. The interior landmark, on the 65th floor of Rockefeller Plaza, was designated by Landmarks on October 13, 2012 and approved by the City Council on December 18, 2012. The Rainbow Room, which was first opened in 1934, was designed by the firm Associated Architects, under the supervision of architect Wallace K. Harrison and interior designer Elena Bachman-Schmidt. The historic nightclub and restaurant features double-height windows, opulent chandeliers and sconces, a circular dance floor, and a domed ceiling. The room underwent an extensive renovation in 1987, overseen by architect Hugh Hardy. The Rainbow Room has been closed since 2009. Architect Michael Gabellini, of the firm Gabellini Sheppard, stated that the design intent was to “preserve all the original architectural features,” and that alterations would be purely “cosmetic.” Gabellini also said the goal of the project was to revivify the Rainbow Room’s “spirit as a premier entertainment, social & theatrical venue.” Floor, wall, and ceiling surfaces would be altered, though the existing configuration of the room would be maintained. New modern lighting would be installed, as would air conditioning and sound systems, and older duct work would be removed. Fabric on the room’s walls, originally brown or plum is currently in poor condition, and would be redone with pearl-grey material. The ceiling would be painted in shades of white. The circular, rotating dance floor would be redone in oak and rosewood. Gabellini noted that the existing dance floor is the room’s third and was not the original. A new carpet would be installed in a “Deco-inspired” pattern. One missing chandelier would be replaced, and the others restored. Sconces and railings would also be refurbished. The Historic Districts Council’s Nadezhda Williams found the proposal appropriate, but asked that “utmost attention” be paid to the wall coverings, and also questioned the need for a redesigned dance floor. Chair Robert B. Tierney stated that Manhattan Community Board 5 had issued a resolution deeming the project appropriate. The Commissioners voted unanimously to approve the certificate of appropriateness. LPC: The Rainbow Room, 30 Rockefeller Center, Manhattan (13-8503) (Jan. 8, 2013) (Architect: Gabellini Sheppard).